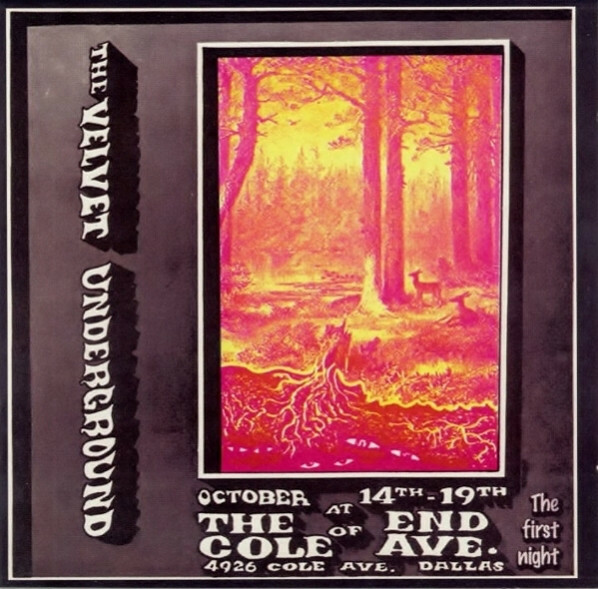 Doom & Gloom from the Tomb: “Astral Weeks,” Van Morrison, Aquarius Theater, Boston, Massachusetts, May 19, 1972. With the impending release of Ryan Walsh’s Astral Weeks: A Secret History of 1968, finding a live performance of any of the songs by Van in Boston is an unexpected treat, even if it’s a few years after the event. But this performance is doubly a treat: peak Saint Dominic’s Preview-era Van Morrison, with much of the hazy adventure of the original performance supplemented by a forthrightness and confidence (and horn section) characteristic of the latter record. A fun listen. There are some songs where my attraction to the music is clear and immediate; others drift in over the transom. I first found Coralie Clément‘s song “Bye bye beauté” in a cover version by Nada Surf, on their 2010 covers album If I Had a Hi-Fi. After I found I couldn’t get the song out of my head, I finally went looking for the album. The music (written by Clément’s brother Benjamin Biolay) simmers and builds; her voice is above it, breathy but intense. Finding the record on eBay was a heady, exciting moment, tempered by two things: it wasn’t complete, and I wasn’t alone. I have learned over the years that, while they don’t draw hundreds of bidders, works of history from the University are of enough interest to a small number of collectors that bidding can be competitive. I knew that I could probably win the auction if I paid enough attention—though I’ve lost my fair share of items, I’ve won more than I lost, thanks to a sixteen-year-old paper by one of my grad school professors. I knew that there was at least one other bidder, so I set an alarm for the last day of the auction and waited. The day of the auction arrived and I won, despite a flurry of bids earlier in the day. (The odds are good that the other bidder is reading this; sorry and better luck next time!) Now I just had to get the record. And here Fate intervened and made me wait. The auction ended New Years Eve, one of a series of bitterly cold days with highs in the single digits. The next day the seller contacted me to tell me that he would mail the package a day later, since it was so cold his truck wouldn’t start. I could sympathize, having had to jump-start my own car so that I could take it to the garage to get a new battery. 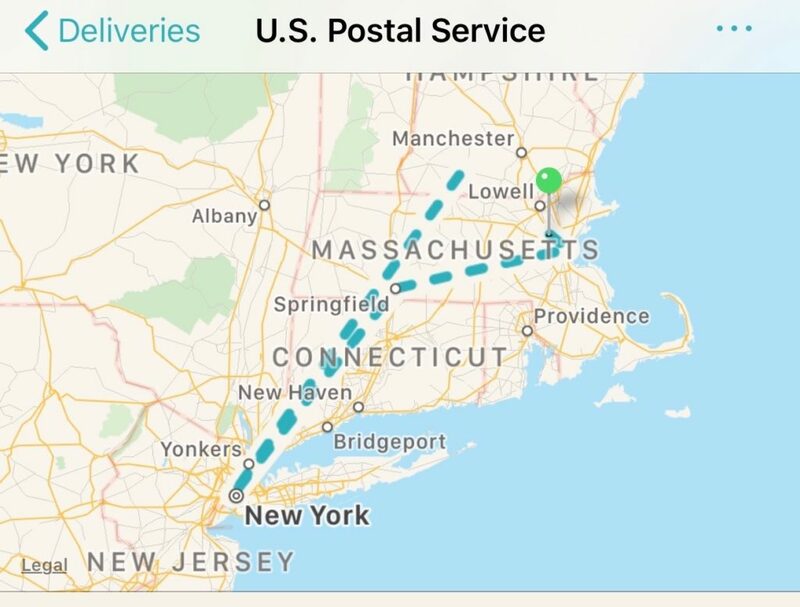 So I waited and watched as the package was shipped—two days before a huge storm that dumped 17 inches of snow on Lexington, Massachusetts. But it finally arrived earlier this week, and to my delight, while the original sleeve was in poor shape (the seller thoughtfully put the record in a new sleeve), the record looked like it was pretty good. Now all I had to do was to listen to it. Here we had a small snag: my otherwise-wonderful Denon DP-45F turntable has no 78RPM setting. But I was going to digitize the record anyway. So I played it back at 45RPM, and then (as I noted earlier this week) used Amadeus Pro to speed up the playback by 173.3% (78/45). I tried noise reduction but didn’t like what it did to the tone of Thompson’s piano, so I left it alone. Ultimately, I was pleasantly surprised by the performance. Listening to Thompson’s solo piano introduction to the movement, one is reminded of the historical moment in which the work was written. This was April 1943, more than two years into World War II, and many of the young men singing the work were painfully aware that Jefferson’s words about dying with light and liberty on the advance were not going to be hypothetical for them. The following vocal entrance is appropriately hushed, and the Glee Club declaims Jefferson’s text with clarity and good pitch. The reintroduction of the first-movement “The God who gave us life gave us liberty at the same time” is not strident (as in the 1945 BSO/Harvard Glee Club performance) but nuanced—perhaps because the Virginia men only had to be heard above a piano, not a full orchestra. Only the final chord shows vocal strain in the high tenors. And here it is! As noted above, the only manipulation was speeding up the playback to restore normal speed, and to join the two halves of the recording into one—which fortunately was pretty straightforward. Enjoy! 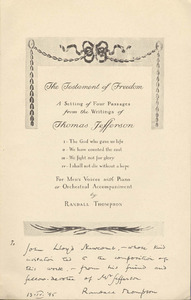 Sometime in late 1942 or early 1943, University of Virginia president John Newcomb commissioned a new work from the head of the music division (not yet the McIntire Department of Music), composer and professor Randall Thompson, to commemorate the 200th birthday of Thomas Jefferson, which would be celebrated April 13, 1943. Thompson looked for appropriate texts for the occasion and found them in Jefferson’s own letters. In January 1943, Thompson had taken over the directorship of the Virginia Glee Club as Harry Rogers Pratt stepped down to focus on the war effort. The Glee Club provided, presumably, a solution to a significant challenge: how to mount the forces for a concert with a student body that was perpetually being shipped off to war. 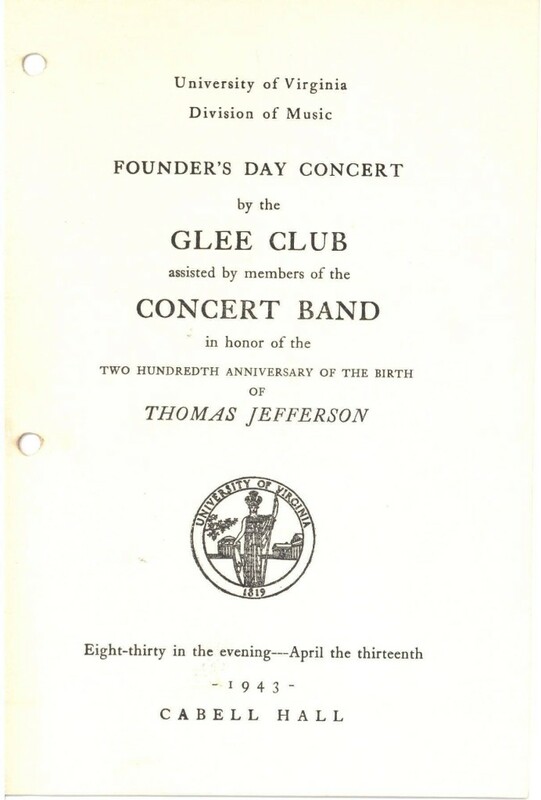 The Glee Club, while reduced greatly by the war effort (the 1942-1943 group officially numbered 45, down from 130 in 1940-1941), at least still performed. And Thompson knew them, having conducted them in his “Tarantella” the preceding spring. Accordingly Thompson composed the new work for men’s chorus and piano. The actual concert was held on Founder’s Day and featured “music proved to have been owned or known by him,” according to the program notes from the concert. Significantly, the concert was broadcast nationwide on the Columbia Broadcasting System, and was recorded for later playback over the Armed Forces shortwave in Europe. It was a hit; Thompson’s obituaries noted it as his best-known work, and it was used in 1945 by Serge Koussevitzky (with the Boston Symphony and the Harvard Glee Club) to mark the death of Franklin D. Roosevelt. 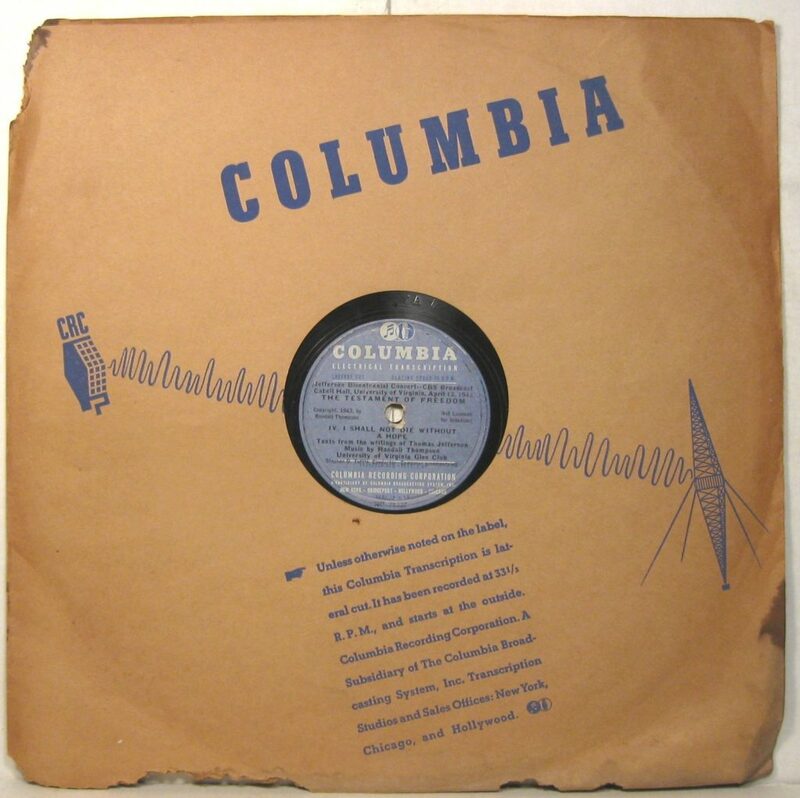 I have long known that copies of the recording existed—in fact, a few years ago I found mention in a contemporary issue of College Topics, the precursor to the Cavalier Daily, that the Glee Club was privately selling “records … being made by Columbia Recording Corporation” that featured “reproduction of the first performance of [The Testament of Freedom] last April 13 with Stephen D. Tuttle conducting and the composer at the piano.” I figured I would have to go to the University to hear its archival copy. I couldn’t let it go. I had to be able to listen to it. Tomorrow: getting, and listening to, the record. And by glimpse, I mean listen—though you can only hear a 30-second preview of each of the six sides of the six-record set (from the 78RPM era). To hear the samples, click the Play button beneath the scan of the record label in the center, then hit the Next button (right triangle) in the header and click Play again. It’s clumsy but it works. And interestingly, side 5 raises doubt that Harvard’s Glee Club in 1945 was substantially more musically sophisticated than its Virginia counterpart. The opening of the last movement, “The God who gave us life gave us liberty at the same time,” is here shouted with uneven pitch and vowel pronunciation (direct link to a downloadable 30-second sample). 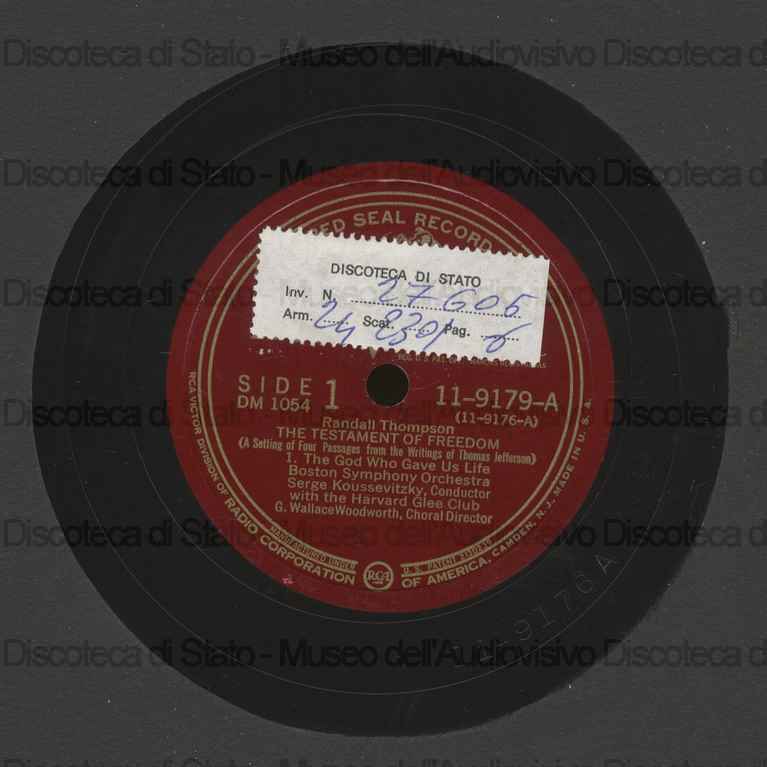 I hope to be able to compare the recording to the Virginia Glee Club’s 1943 premiere soon. Side B finds us in more familiar Pops territory: samba, waltzes (Strauss and Richard Rodgers), a Sousa march, and, the sole non-dance “light classic” on the program, Khatchaturian’s “Sabre Dance.” Compared to the version that appears on Pops Festival (which was in turn anthologized from elsewhere), this version wears Army boots — it’s heavy, driving (at least 20% faster than the older take), and with a corresponding lack of detail in the performance. “Sabre Dance” was a “greatest hit” and appears to have suffered one of the fates of greatest hits—a certain fatigue and contempt on the part of the performers. Here’s the Pops’ take on “Do You Know the Way to San Jose?” Enjoy! 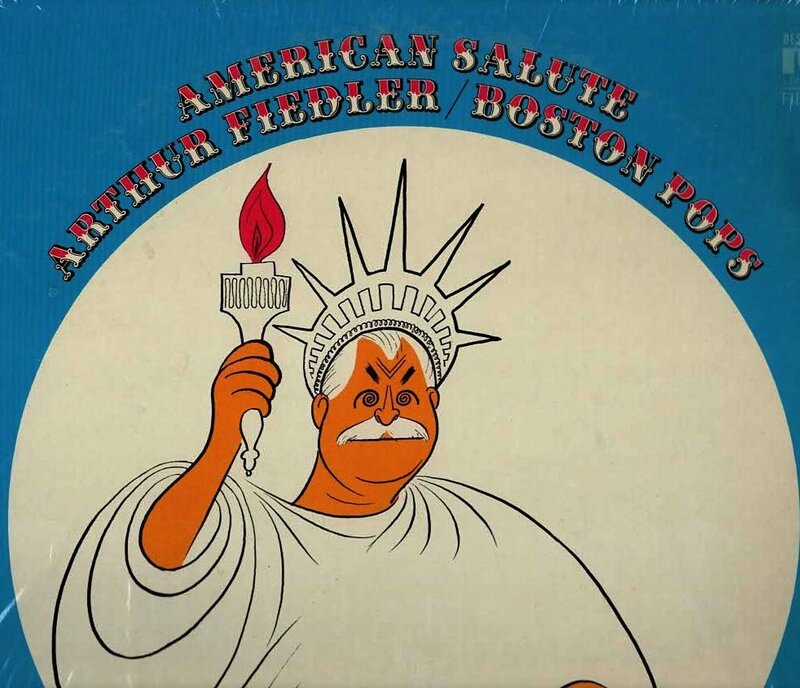 In yesterday’s review of American Salute, we started to see the Boston Pops crossover machine in full swing as Chet Atkins joined the Pops and Arthur Fiedler for a few tracks on this album of Americana. Today’s 1972 record—a recent eBay find for me—is deep in the heart of crossover-land: it’s a document from a 1971 performance of Evening at Pops with a headliner celebrity narrator—the inimitable Julia Child, no less—and a bunch of lowercase-p pop songs, alongside the lightest of light classics. Let’s start with Evening at Pops. 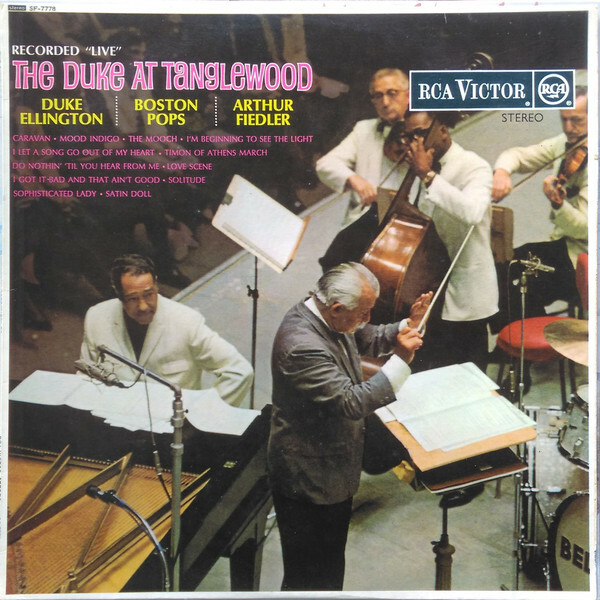 Most modern audiences outside the Boston area probably trace their knowledge of the Boston Pops to this television program, which aired over PBS from 1970 to 2005 (that this is the year I joined the Tanglewood Festival Chorus can only be ironic coincidence). Wikipedia calls the program “the public television version of a variety show,” and this is a fair description, judging both from the contents of this record and the curiously wistful timeline captured on the program’s last website. In terms of programming, there are a few surprises here. The opening is a full-orchestra arrangement of John Morris’s great (second) theme song for The French Chef, Julia Child’s breakthrough PBS cooking show. I don’t know how many times the Pops performed the kids’ classic “Tubby the Tuba,” but Julia makes a hysterically sympathetic narrator in her trademark burbling tones—and adds a unique punchline all her own at the end. The Sesame Street gang also appeared in the 1971 Evening at Pops lineup, so an arrangement of the theme song follows “Tubby.” It’s in turn followed by “I’d Like to Teach the World to Sing,” in an incredibly timely arrangement of the November 1971 hit based on a Coke jingle. The second half of the record is more familiar Pops fare: we get two Leroy Anderson numbers (“Bugler’s Holiday” and “A Trumpeter’s Lullaby”), “Jalousie,” two Tchaikovsky movements from the Nutcracker (“Dance of the Sugar Plum Fairy” and “Dance of the Toy Flutes”), and as a closer, “76 Trombones.” Almost all this fare could be found on earlier Pops recordings like Pops Festival. So if you look at the overall program, it’s really a standard Pops program, with the celebrity narrator guest elevated to headliner. But by this time “standard Pops” was only about 50% light classics and was relying increasingly on pop songs and other pop-crossover fare. We’ll see that in tomorrow’s record as well. Here’s Julia Child reading “Tubby the Tuba” from the TV broadcast. Enjoy! Both covers feature Al Hirschfeld caricatures of Fiedler—this one in an attractive Statue of Liberty get-up. Both have some marches — in this case, “American Patrol,” an 1885 march by F.W. Meacham. Both even feature some lesser known classical works, in this case Morton Gould‘s 1942 “American Salute” and William Schuman’s “Chester” from New England Triptych. And then there’s the tracks on either side of “Chester” — the “Tennessee Waltz” and “By the Time I Get to Phoenix,” both of which feature the guitar of Chet “Mr. Guitar” Atkins. Let’s let that sentence sink in for a minute. Not only did Richard Hayman arrange Jimmy Webb’s “By the Time I Get to Phoenix,” but Chet Atkins played guitar on it, as well as on “Galveston” and “Alabama Jubilee.” What happened? 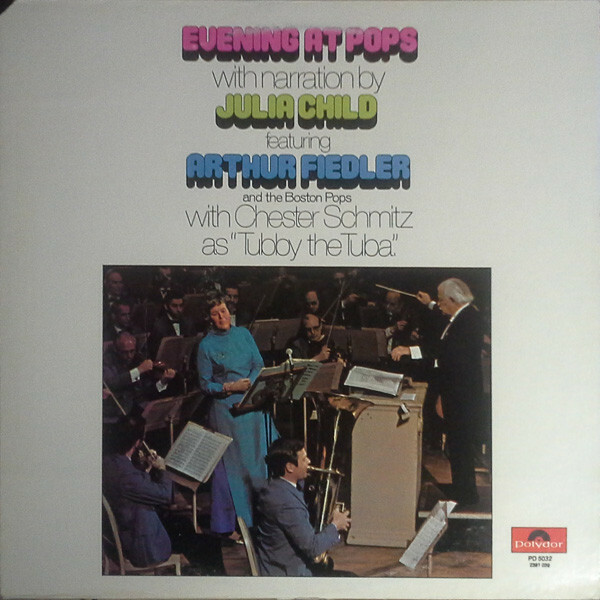 As it happens, this album was the third to feature a collaboration between Atkins and Fiedler’s Pops, following The Pops Goes Country and Chet Picks on the Pops. Fiedler and Atkins shared a common interest in bursting free of their genre restrictions and “crossing over.” In these recordings, Atkins took his “Nashville Sound” to its logical conclusion: replacing anonymous backing string players with a full orchestra. 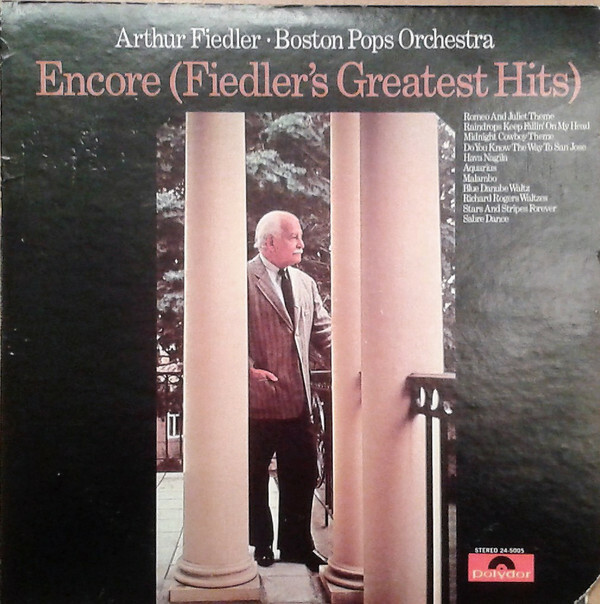 And Fiedler was canny enough to recognize a collaborator who would broaden the audience for his Pops orchestra far beyond fans of “light classics”… though, some would argue, not without a cost. Here’s the recording from the album of that “By the Time I Get to Phoenix.” When we get back, we’ll be in the thick of the Pops’ mass popularity, with a visit from a very special guest and a whole new venue.